Sign up here to be notified if new spots become open. The best way to get on my schedule with less waiting is to join the Starship Warp Drive. You'd like more sales and more reach and more opportunities…but you don't know what else you could do to get them. You need a Flight Plan, so you know where to go next. Together, we'll craft one. You'll tell me where you want to go, and I'll help you identify what's already working (and what's not). You'll get homework to start taking action and making progress. My superpower is finding your star-studded sparkle + pairing it with a do-able plan. I ask the questions that bring out your best ideas, your shiniest strengths and your real enthusiasm. I'll help you craft a plan from that shiny place, so that everything you do is sparkling with crystal-clarity and ease. We'll craft your flight path through conversation and question-asking. When you register, you'll get a Flight Manifest, with a series of questions for you to answer. You return it and we schedule your Flight Plan session. When the time comes, we get together and start sketching solutions. Click Add to Cart to schedule your session! Love your newsletter. Seriously. Your people want you to talk to them. And you want to talk to them. So let's find a way to send them love notes, field notes, or secret messages in an enthusiastic way. A 60 minutes sessions of conversation + path-building*. Together we find solutions that you actually like, and then we find all of the next steps you need to do. In the first session we'll identify what's working and what's holding you back. I'll give you some homework to start making progress. In the second session we'll check in on your progress and make a final plan for you to move forward, based on what we've discovered WORKS! A dress design company wants to rock their social media platforms. Together we developed a plan for their newsletter, their tweets and their schedule – without creating a new pile of work. An author has a brilliant book but few resources to invest in selling it. Together we identified her assets and built a plan that was her publishers most successful launch ever. After you pay, I'll send you an email within 1 business day. 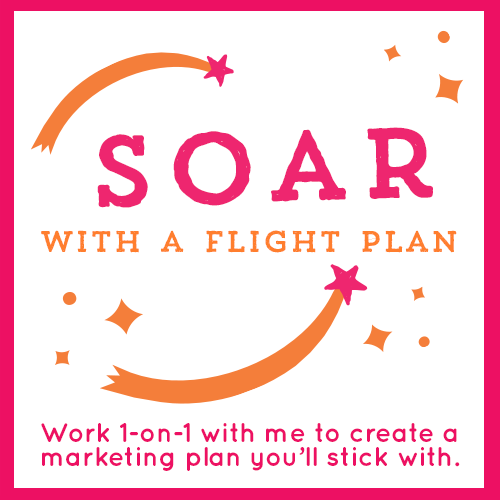 I'll include information on scheduling your call and send you the workbook to fill out before we jam, so I can get to know you and your business before we start. Share your questions, concerns, or stuckness beforehand and I'll be pondering and ideastorming before we ever get on the phone.